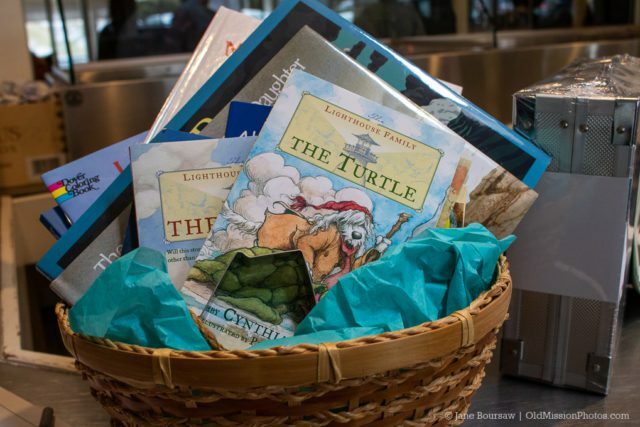 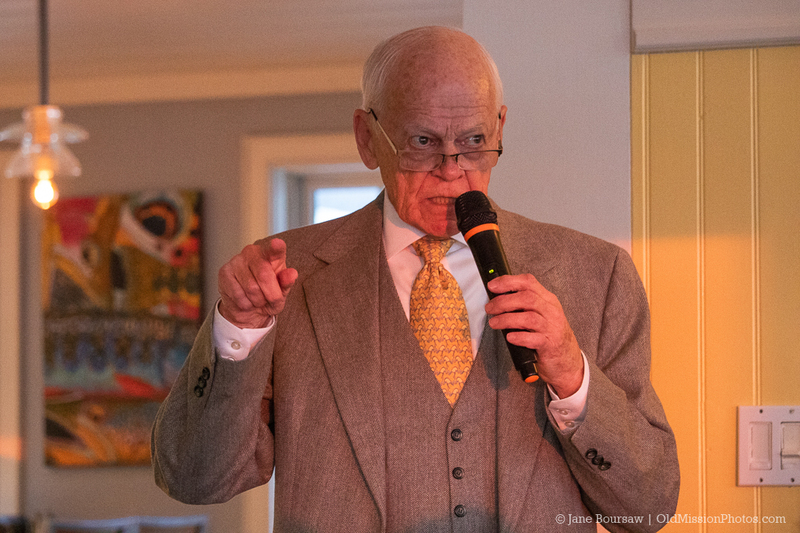 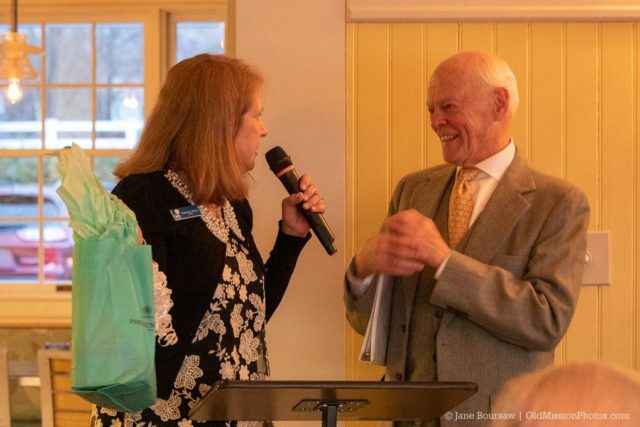 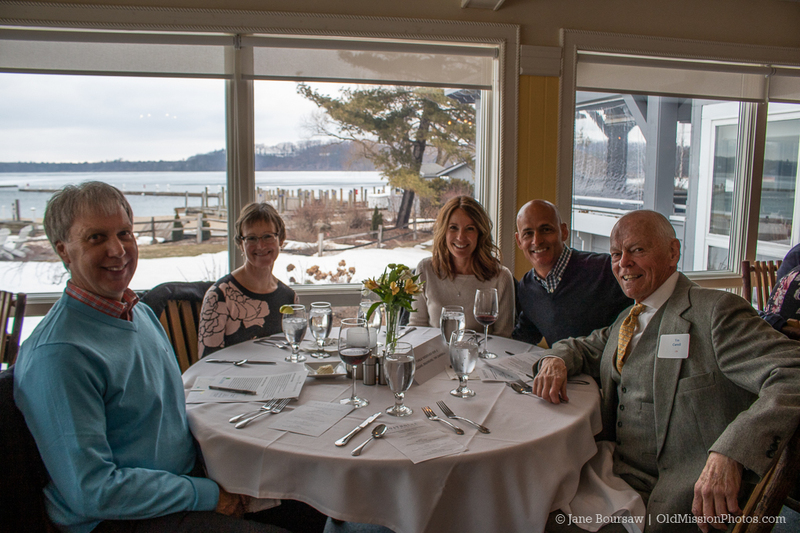 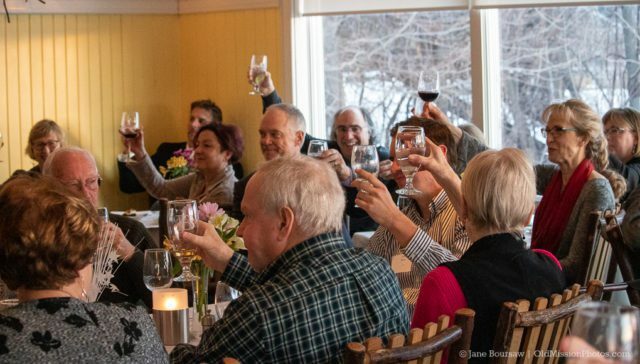 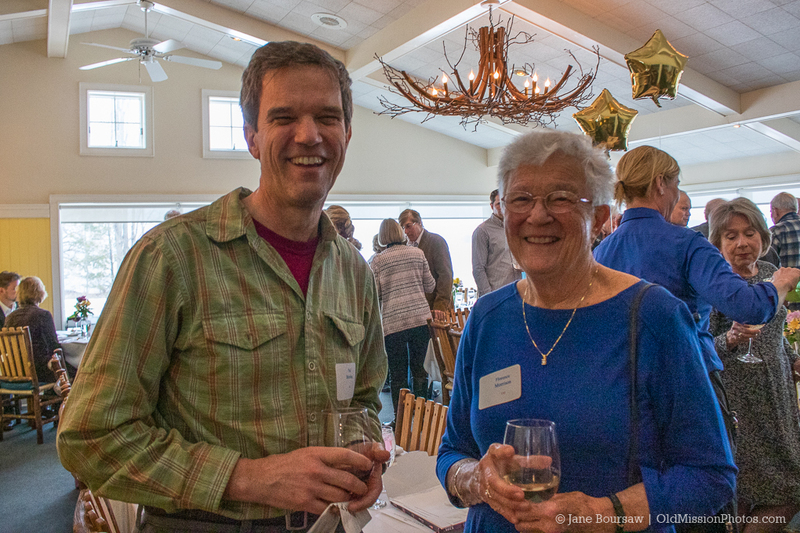 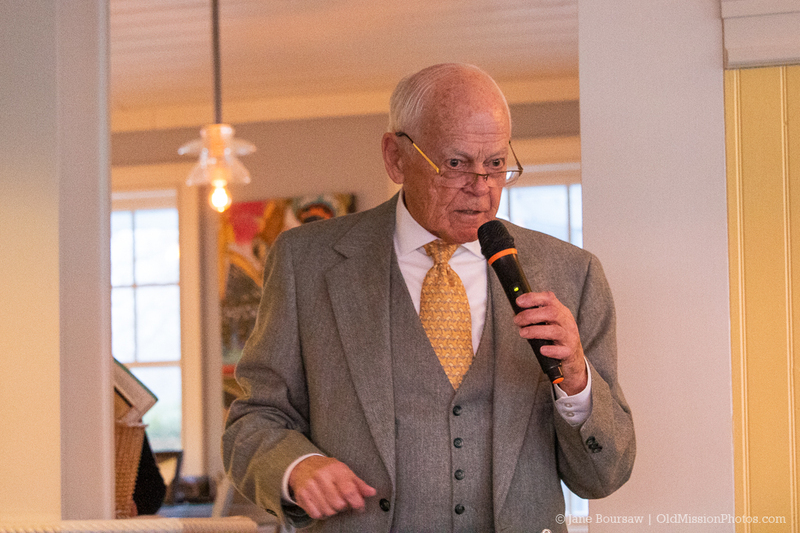 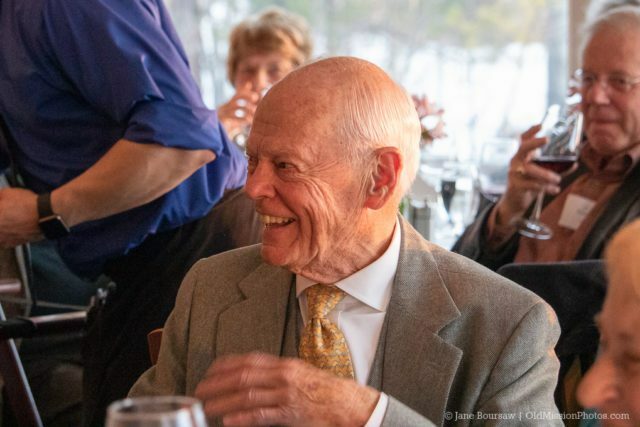 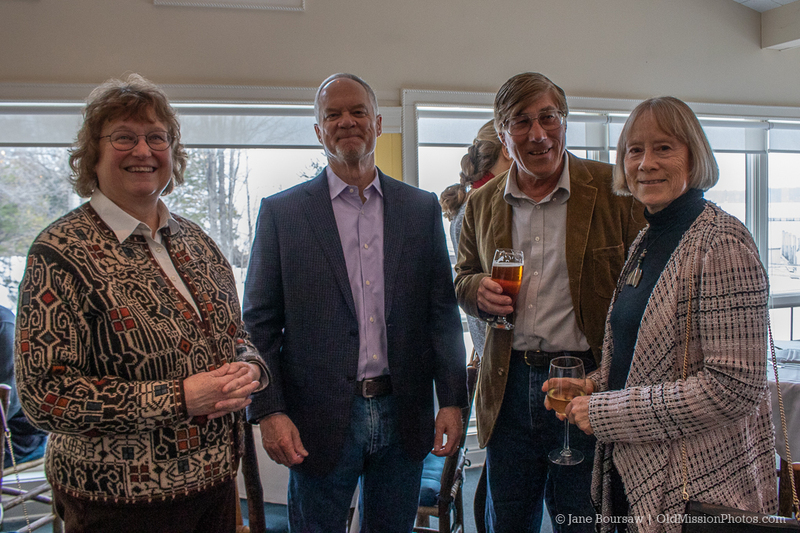 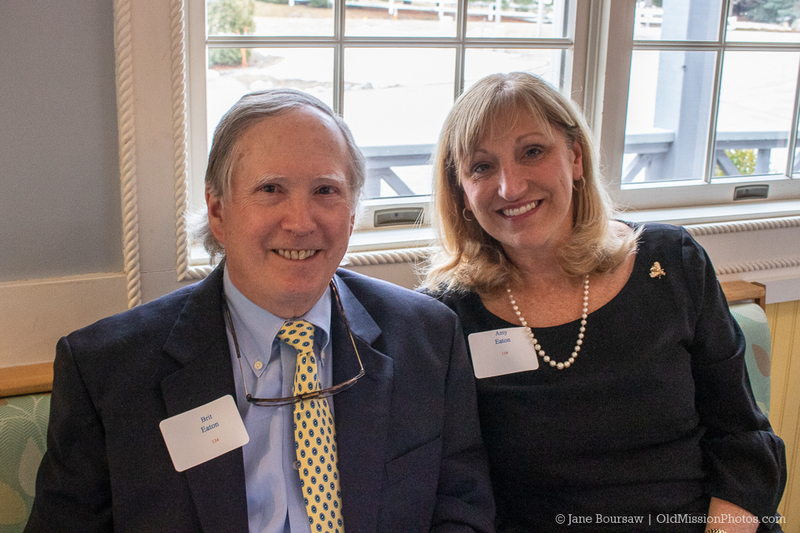 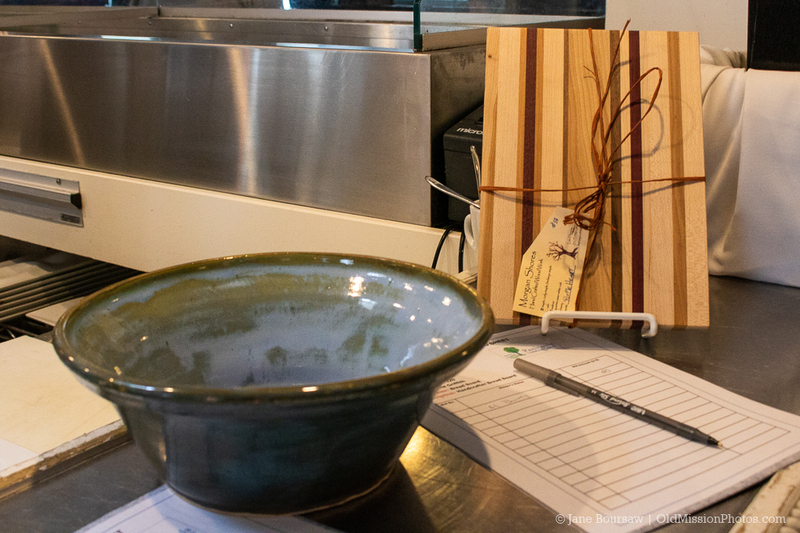 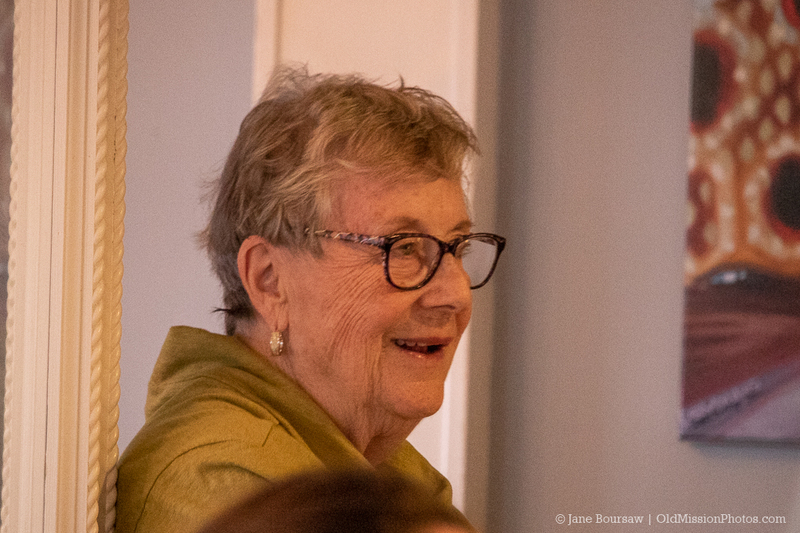 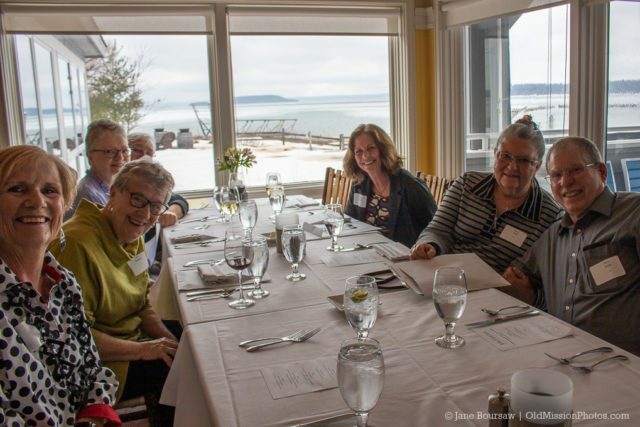 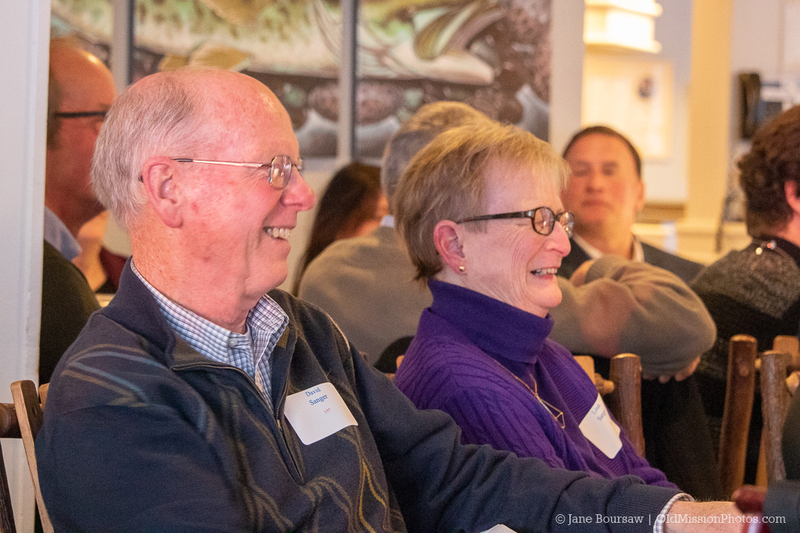 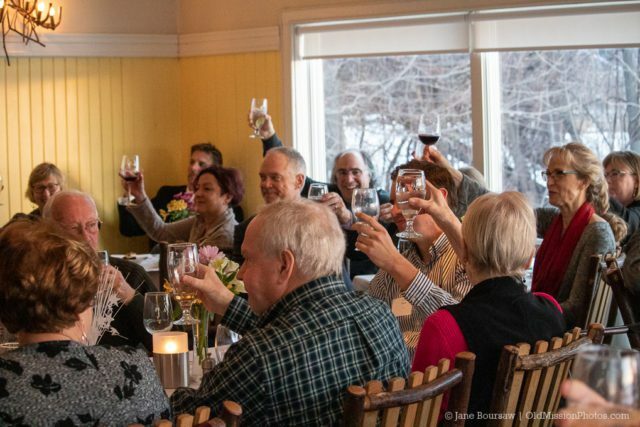 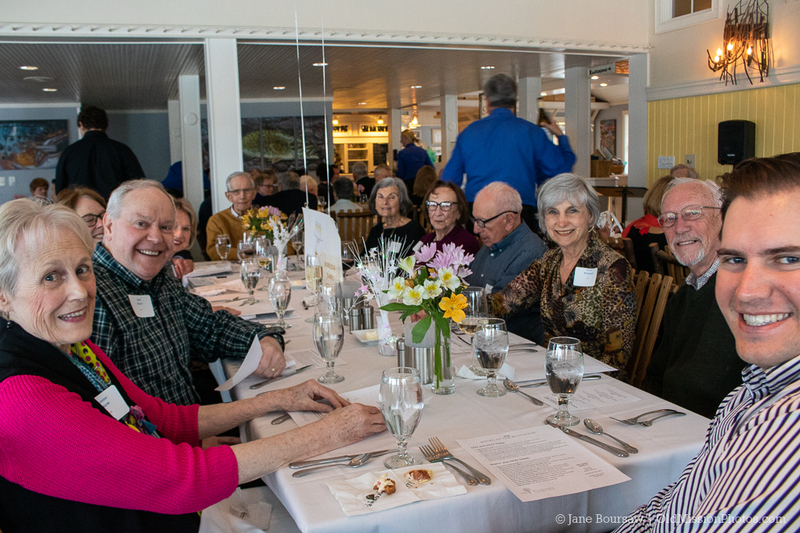 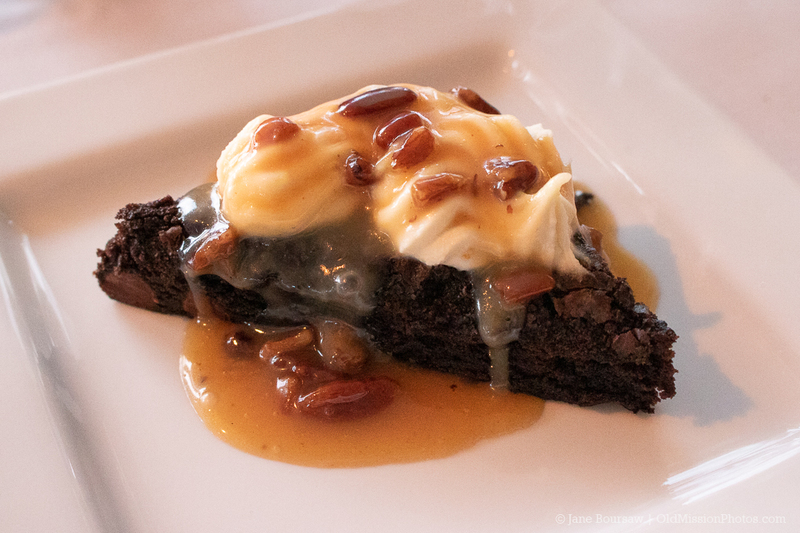 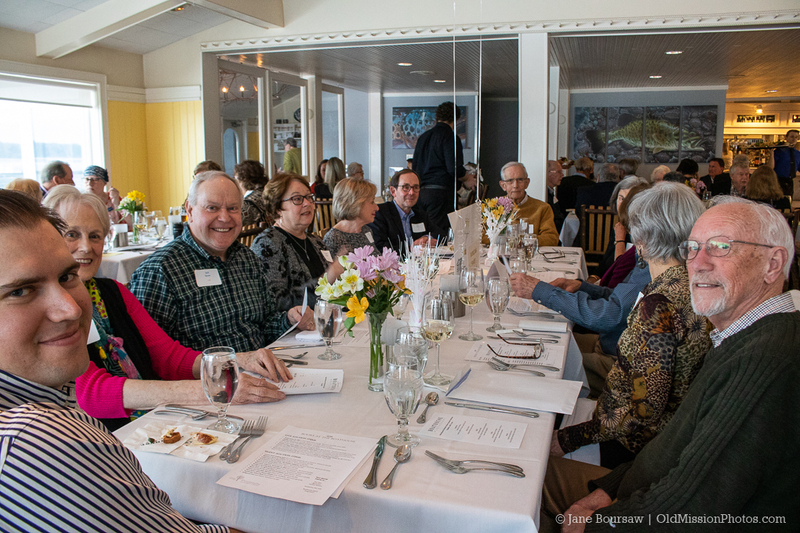 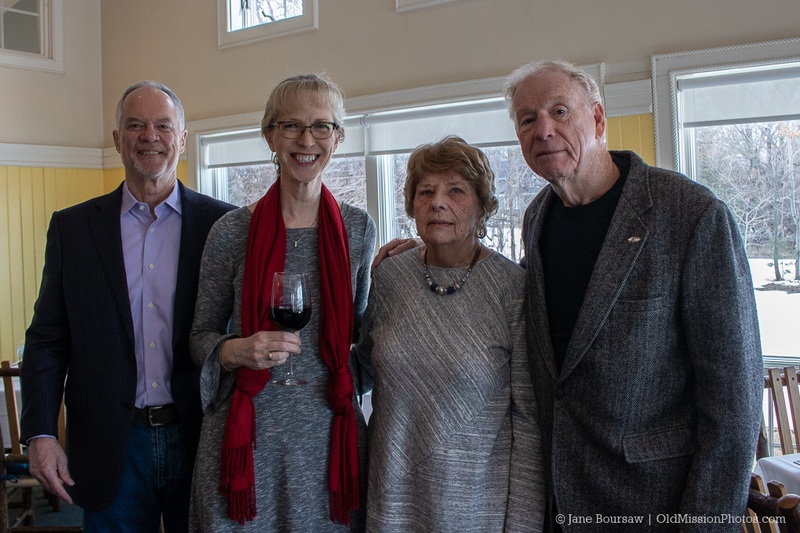 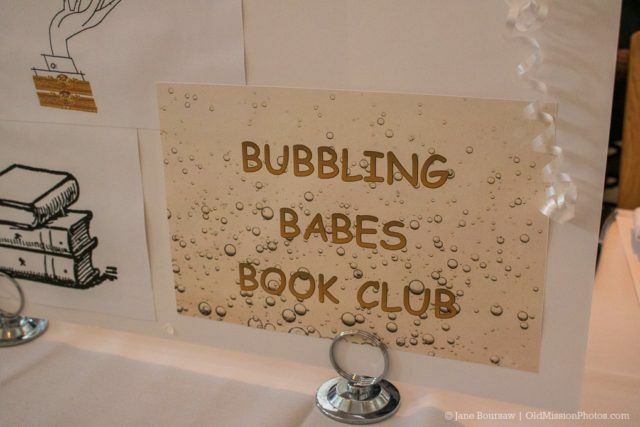 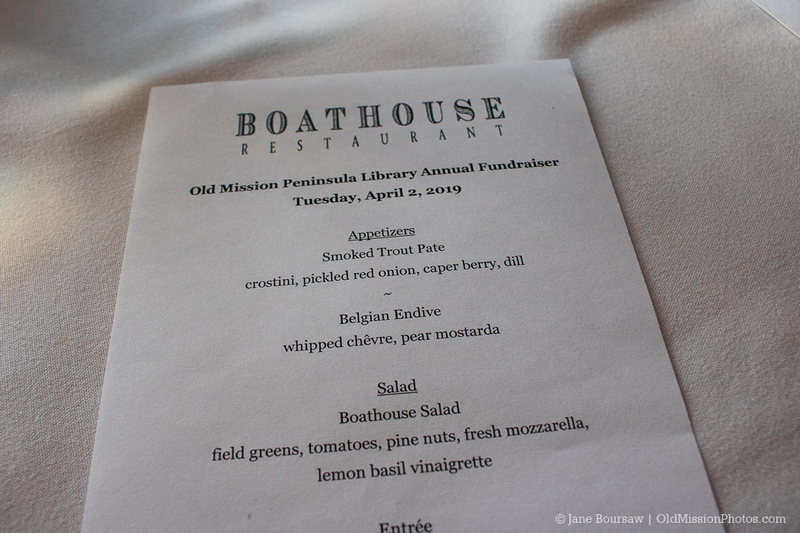 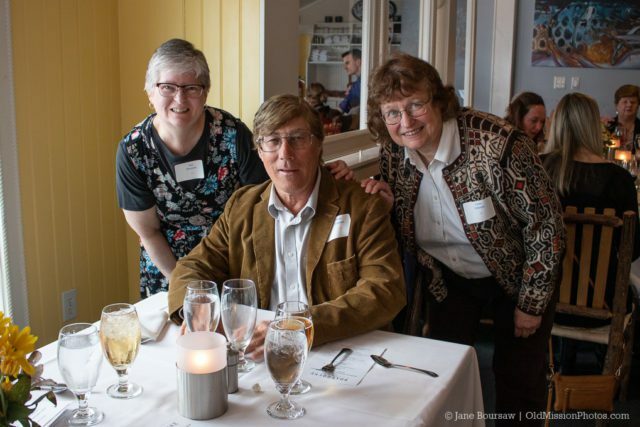 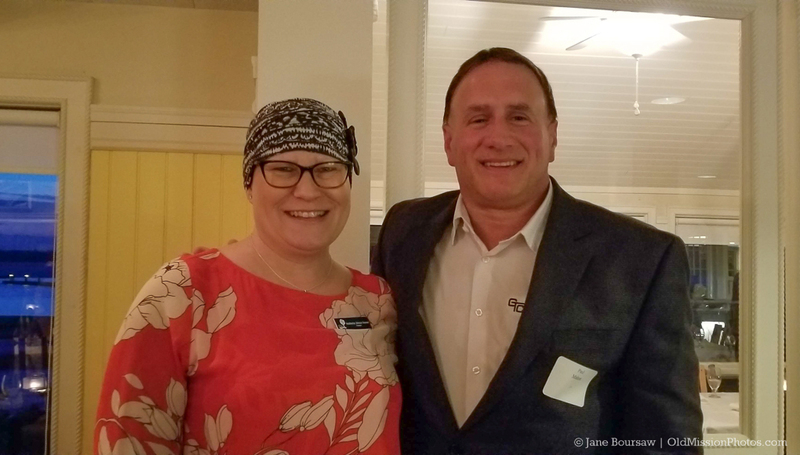 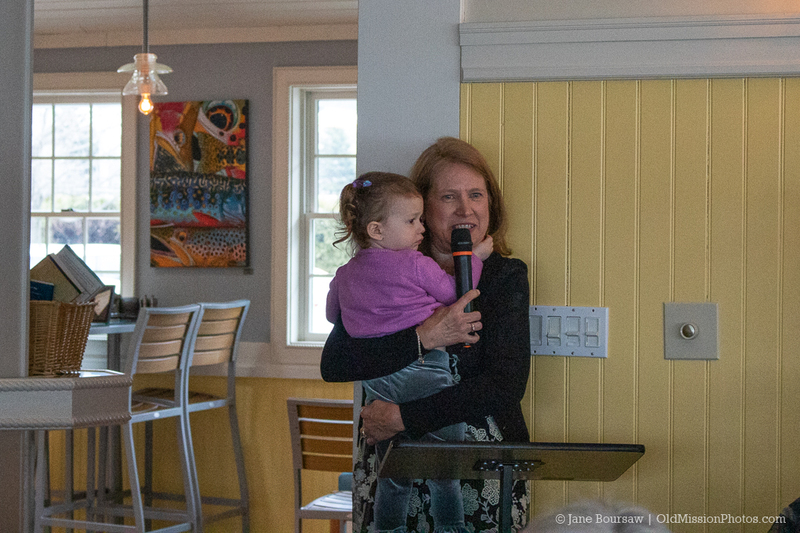 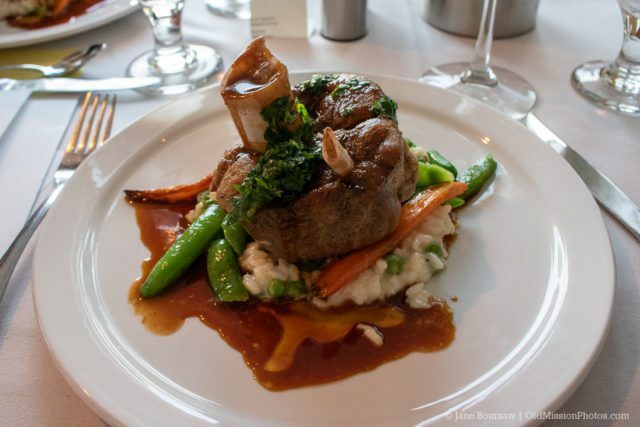 The annual “Books at the Boathouse” fundraiser for Peninsula Community Library (PCL) was held on Tuesday, April 2, 2019 at the Boathouse Restaurant on Bowers Harbor. Between ticket sales, donations and auction items, the event raised about $19,000 for the new Peninsula Community Library, currently under construction with Grand Traverse Construction at the corner of Center Road and Island View Road. 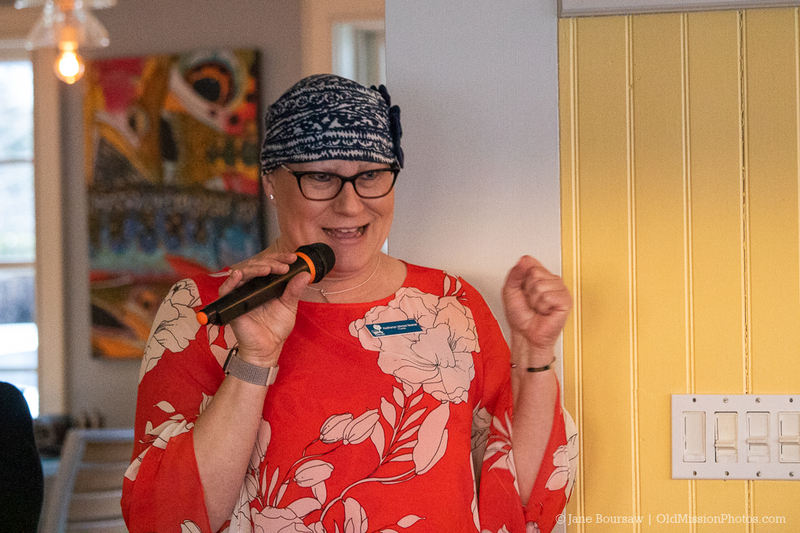 PCL Director Vicki Shurly notes that they have enough to cover the building, but still need to raise $190,000 for additional landscaping, furniture, utility hookups and more. 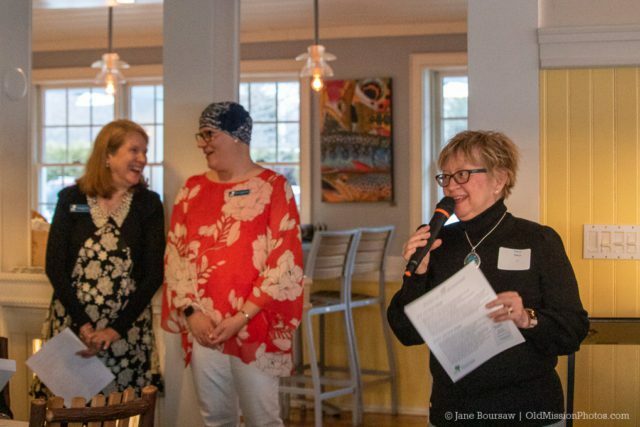 Learn how you can help here. 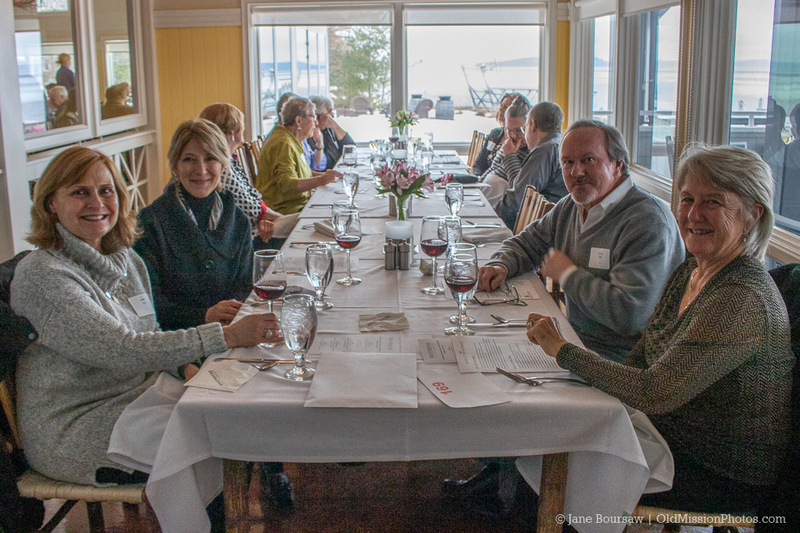 The fun event included a silent auction, a live auction emcee’d by WTCM radio host Ron Jolly, and a delicious dinner that included smoked trout pate, Belgian endive, braised Michigan pork shank with parmesan risotto, and a double chocolate brownie cooked up and served by the Boathouse staff. 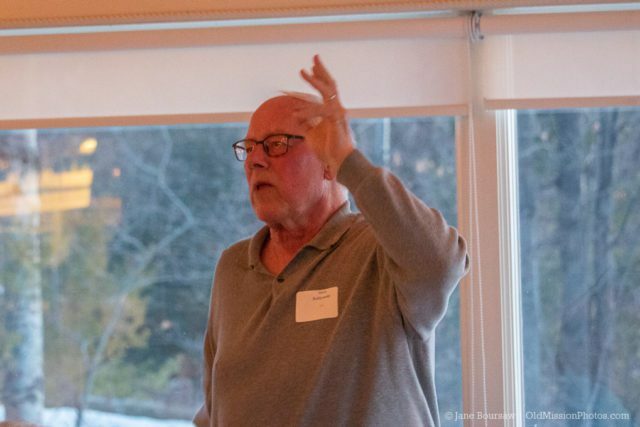 Old Mission Peninsula resident Tim Carroll gave the keynote speech, which included plenty of OMP history, lore and laughs. As it was also Tim’s 80th birthday, the crowd toasted to his health as PCL director Vicki Shurly presented him with a cake – and a gift straight from London! 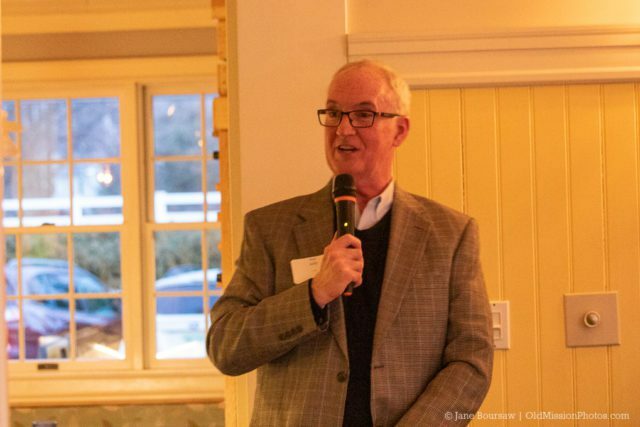 Read our interview with Tim Carroll here, where he talks about his donation to the History Room at the new Peninsula Community Library. 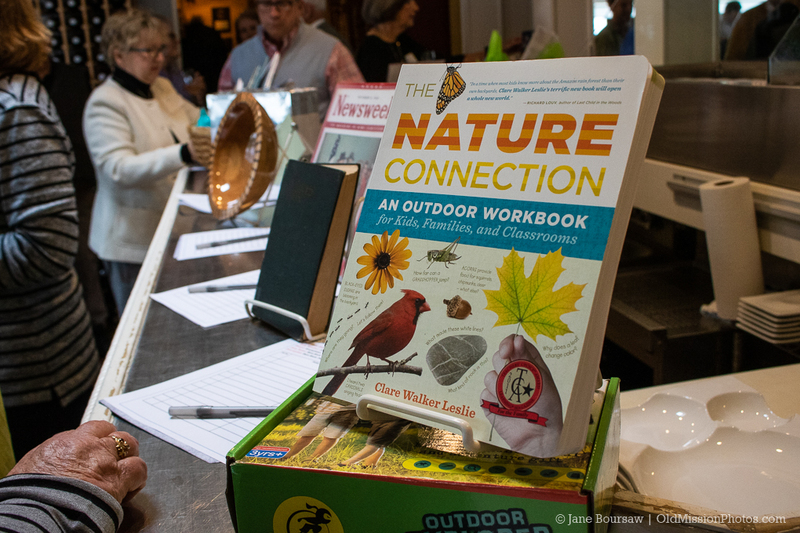 ALSO READ: Photo galleries of the 2017 and 2018 Books at the Boathouse events. 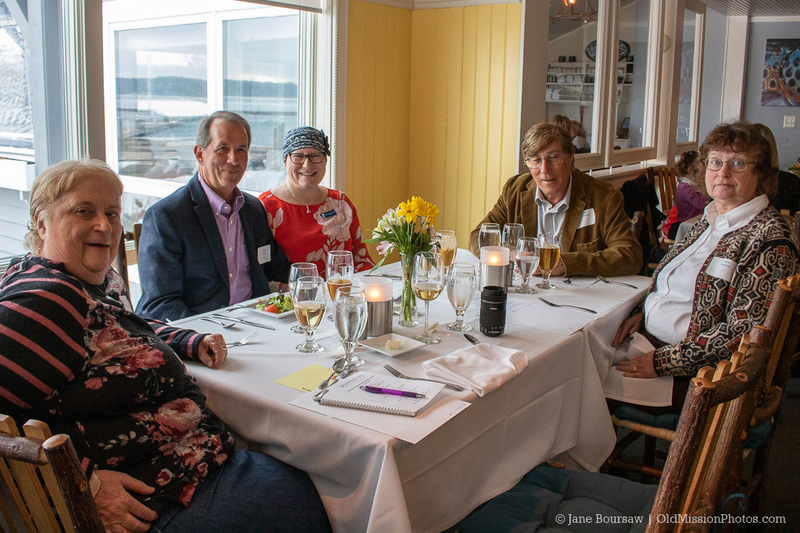 Below are a few more photos of the fun event. Event photos are available for sale as downloads, prints and more at OldMissionPhotos.com. 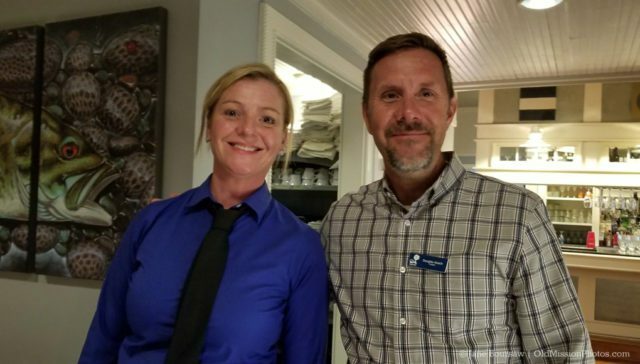 Well done as always. Thank you. 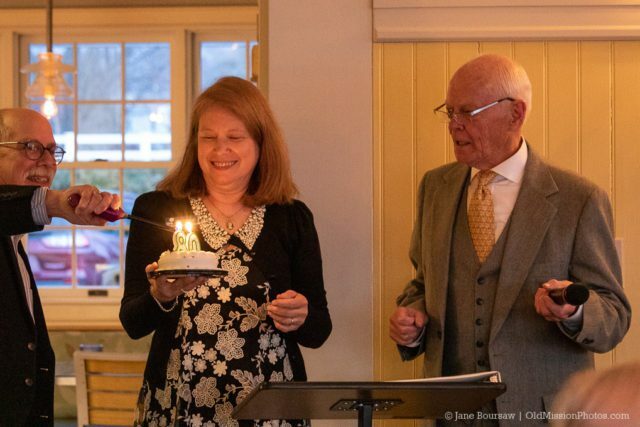 Wonderful evening. 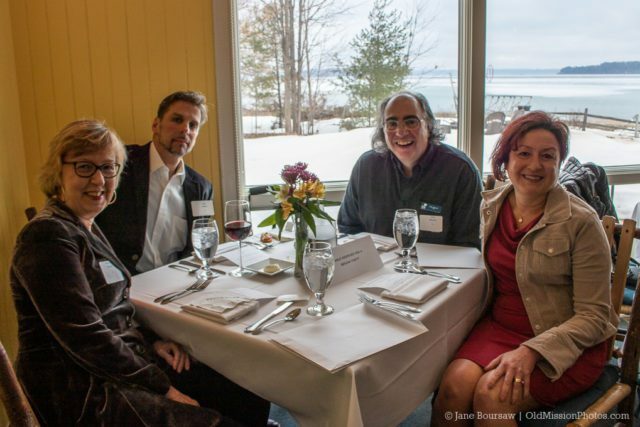 Thanks to The Boathouse crew, Doug Kosch, all our donors and attendees and to Jane Boursaw for the great coverage!